There is unanimous consensus: – It is given that Shawn Porter (26-1-1, 16 KO) will be constantly moving forward, attempting to smother, maul, and minimize space between himself and Keith Thurman (26-0, 22 KO). From there, Porter will want to outpace Thurman who has himself shown a susceptibility to fatigue, e.g., in the latter rounds with Robert Guerrero. As I say that, I conclude that this was an anomaly. I conversed with myself again and thought, Guerrero never engaged Thurman until the last few rounds when he had been hurt and had gotten desperate. Thurman had taken no punishment, had dealt with no pressure. But then there was the then undefeated Diego Chaves who was Thurman's toughest opponent, who had pressed Thurman every round, had Thurman bleeding from the mouth and nose from hard punching. Thurman incrementally increased his control over Chaves with his patient boxing before taking him out to the body. Thurman later acknowledged that his conditioning was better than Chaves who could have challenged Thurman even more had he been in better shape aerobically. Against Chaves, Thurman proved he was durable. He seemingly unproved this when he was hurt from a punch to his liver by Luis Collazo while his arms were elevated, his trunk relaxed, not in expectation of the blow he received. But I have here already described the nature of this freak occurrence: the lower aspect of the liver extends beyond, and is unprotected by, the ribcage. This was likely a fluke. Indeed, Thurman endured significant wear and tear from Diego Chaves whose reputation was that of a thudding knockout virtuoso. Collazo is now seen as a previously cherry picked opponent of Amir Khan, chosen as Khan's first opponent at welterweight because he was reputed to be a soft puncher. But then, Thurman had been “hurt”, “staggered”, “wobbled” by Jesus Soto Karass in the first round. Thurman was caught on the chin while attempting to hit Karass with an uppercut at distance. It would be reasonable for Thurman to be startled and knocked off balance at the very least, for he was not braced; Karass never landed anything of significance immediately proceeding that moment. And, for as long as it lasted, Thurman bullied Karass and took him out. Feeling that I have cleared up this nonsense about Thurman's vulnerabilities, I am again taken back to the aforementioned discussion of Thurman-Guerrero. Guerrero is an undersized “welterweight” - arguably a legitimate lightweight at this time – who had his moments forcing Thurman backwards and pinning him against the ropes. There, Thurman threw no effective punches, and the previously heavily bruised Guerrero finished strong while Thurman labored through the completion of the twelfth round. This is pertinent because Thurman had visibly gained substantial weight prior to training for Porter – it has been nearly a year since he fought Collazo. Shawn Porter, who is stocky and prone to gaining weight by nature, keeps his weight down through year-round training. If inactivity is to affect anything, it will adversely impact Thurman's conditioning. For Thurman's heavier, round appearance months ago was unusual for himself. 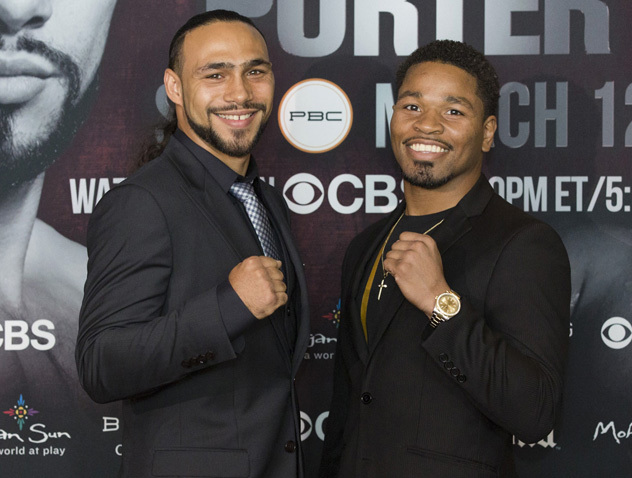 How successful Porter is in crowding Thurman will depend on his defense. When he fought Adrien Broner, it appeared that Porter was always open to the right uppercut and straight right hand. Broner, overwhelmed by Porter's size, chose to move his body completely out of the way to counter with left hooks. Frankly, I am not confident that Porter can elude Thurman's jab, straight right hand, left hook, right and left uppercuts. Porter's head movement is non-existent and I get the impression that he is rhythmic, thinks too much, and loses time when committing to any form of advance. Furthermore, Porter's power is not generated in close. Rather, Porter has effective power when he is at mid-range and jumps in – a la his leaping left hook that shook Paul Malignaggi. Against Malignaggi and Devon Alexander, “pure boxers” not known for bruising punches, Porter had nothing to fear by putting himself in position to get countered. For, even in defeating Devon Alexander, a southpaw, I looked in shock at Alexander's failure to land a straight left hand or left uppercut as Porter dove in. So I finish by stating that I have not seen enough clean, effective punching from Porter to feel that he can win a boxing contest against the best welterweights. He can be saved by Thurman's questionable endurance and seeming discomfort and ineffectiveness in close quarters. But one must favor Thurman by default. The Porter-Thurman card begins at 9pm US Eastern on CBS prime time and 2am on Sky Sports in the UK.